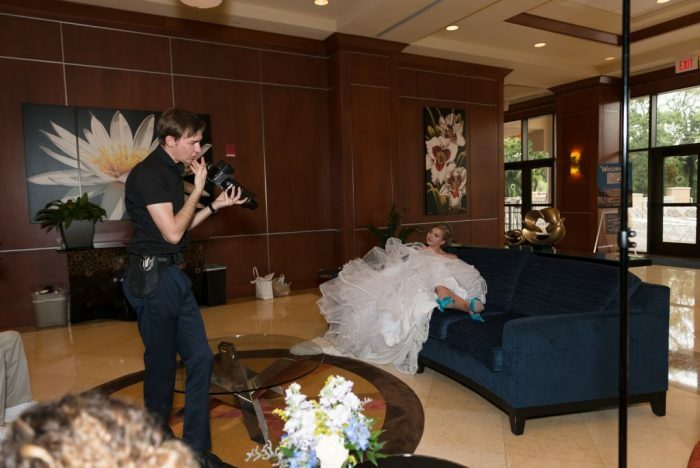 The Characteristics of a Great Photographer - Celebrations of Tampa Bay | Wedding Photographers, Videographers and more! : Celebrations of Tampa Bay | Wedding Photographers, Videographers and more! Our photographer Yaro in action at Hilton Carillon Park St Pete. To be a great photographer, you have to be good at “multi-tasking”. You have be able to adjust all your camera setting in an instant for the changing environments, moving people and posing them, and yet to be friendly while doing it and carrying on a conversation with your subjects. This is not easy, but Yaro is a master at this, making it a fun atmosphere for the subjects (bride, bridal party, groom etc) yet getting them to laugh and have fun, thus creating a pleasing demeanor for great pictures. When I am the videographer, I often edit out the instructions from the photographer in posing the subjects, however not so with Yaro. He makes it so fun, that I most of the time keep his interactions with the bridal party on the video, because it makes for a fun video. I get many photographers who contact us almost on a weekly basis wanting to work for us, and they tell me the equipment they have, and that really means very little to me, because probably a thousand photographers in Tampa Bay have that equivialent equipment. What really makes a great wedding Photographer is his ability to not only be proficient at taking a good picture, but to be able to move quick, be a leader, give direction, yet make it fun for the bride and groom, and Yaro is one of our photographer who certainly has that unique skill to do that.